I just wanted to share some photos of my new Feliz creation. 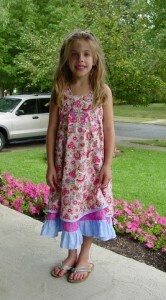 This one is for our beautiful granddaughter Rileigh and she certainly does this dress justice, doesn’t she? I think she really liked it when we took it to her tonight. Her first day of kindergarten will be tomorrow. Oh, how time flies!! I digitized the butterfly on the dress and am making it available under my free designs, children’s section. Help yourselves, and enjoy. I am working on putting together some applique fruit designs and I just need to finish stitching them out. So, maybe by the end of this coming week I’ll have those ready for you, too. I’ll be sending out a notice when I have them ready. I will be sending out the wolf a little later to those on my email list. My webmaster son is out of the country and he needs to show his old Mom how to place an attachment to myemail newsletter when he comes back this week. So hang in there. I haven’t forgotten – I am going to get the wolf to you as soon as I can manage to. In the meantime, have a great week and may God’s special blessings go with you. Wow…that´s a great dress!Your daughter looks really happy in her new dress!I love the “Feliz” pattern too and I sewed already two dresses.Have a nice day! 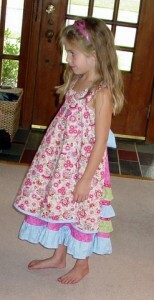 I adore the dresses makes me wish for a granddaughter. You are so talented wish I was.LOL I went to download your butterfly but the download is to far over cannot hit the down load button. I think it will look beautiful on the material I’m using for my emily bag. Thank you so much Oma for your designs and tutorials. I am so glad I found your site. Cindy, I am so glad you “found” Oma’s Place. I am not quite sure I know what you are asking about the underdress? The pattern guides you on how to make the underdress – there is a great pictorial at http://www.farbenmix.de that you can follow. Just go to the gallery. 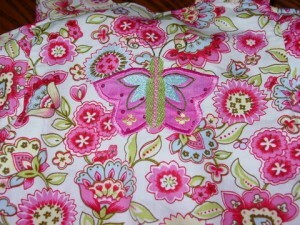 The butterfly is a machine applique design of mine and a free download in the children’s section.